Hey guys, my first suppressor should be out of jail soon based on the wait times others have posted here. I still don't have a pistol host yet. Instead of doing a bunch of research, I was hoping to find something suppressor ready (threaded barrel, taller sights) out of the box. Right now I am leaning towards a Glock 19 TB, but was curious what others recommend. I’ve read many good reports of the CZ Suppressor Ready models. Those or a USP would both be good choices. All that said having shot one gun with suppressor heights sights I won’t be installing any on my pistols. I’ve made it this far shooting through the can. The tall sights are more of an annoyance (to me) than any real help. There is a good one I handled at SHOT. I cannot tell you what model or brand due to a nda. It is scheduled to launch in August. For now just get a P320 with threaded barrel. Nothing wrong with a 19. As mentioned HK and Sig make several options too. Thanks guys. Anyone else have comments about using the taller sights? I've never used them. As far as sights, meh. My 226 Elite Dark has the factory raised sights (no issues on mine), even with an Osprey 9 the raised sights barely clear the can. If I were to put my Octane 9 or 45 on it I doubt the sights would clear. In short, don’t let the sights be a deciding factor. I've learned to just aim through the can. Also if you get raised sights you will need to make sure any holster you get accommodates the raised sights. I have threaded barrels for my G19, G17, and P228. No issues with any of those with my Octane 45. For the glocks, I just bought Silencerco threaded barrels. I too have just learned to just aim through the can so no need for taller sights. For 9mm, I've shot the G19, P226, P229, 90-TWO, PPQ-Navy, and USPc all suppressed. I think the Beretta and PPQ were probably my favorite. i think they all can come with factory threaded barrel models except the USP compact. It only comes with two 17 round magazines. I bought six spare mags at the same time so I could have five per gun. The suppressor height sights seem decent. The front is outlined in orange. Will test fire tomorrow night when I return to work. man, that TACOPS is making me weak in the knees. I've seen the worst performance overall with Glocks. Not that they don't run, but the ejection is erratic and weak. I've seen some to frequently not return all the way to battery depending on the ammunition, suppressor, and barrel used. 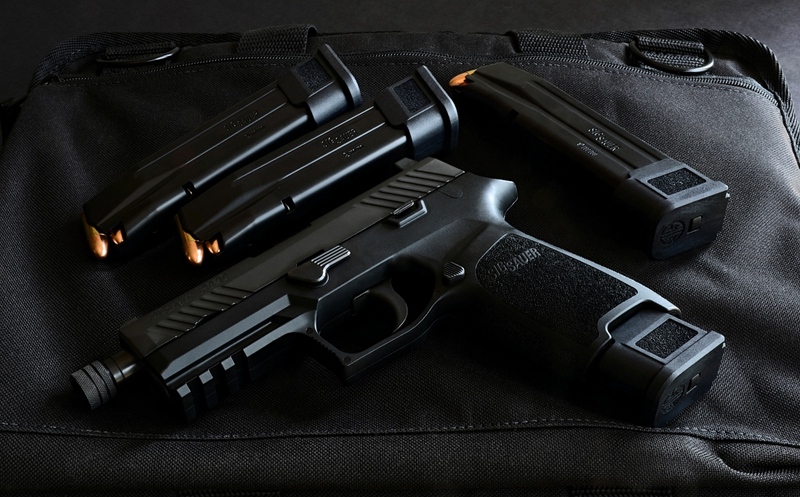 I have seen total reliability from P320 and P226 hosts, however, including solid ejection. The quietest setup I own is a HKUSPF with an Octane. Stupid quiet. Sigs suppress well. My Glocks are on the lower tier as far as suppress-ability goes for some reason. You can't beat a Browning Buckmark or Ruger Mark X with a SiCo Specter II if you are interested in rimfire in the future. Baretta M9A3. I don’t know why, but Barettas sound great with a can. I enjoy my G19 suppressed. The P226 is nice as well.